The sun rise as we're heading out to the fishing area in Los Arenas, and from the shore of Crowley Lake. Way better than GC's photos. Since we are having a cool picture battle, take this! After living in SoCal for over a year now, I can't say I have too many complaints. Nice people, beautiful weather...now if we could just do something about these ugly sunsets. 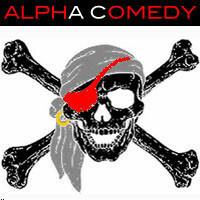 Today is my first post on Alpha Comedy. Actually it’s the first time I’m posting on a blog, any blog, in my entire life and if all goes well this will be the first of many to come. So, what should I write about? How about my kids, Moetown and Quincy? Here’s a picture of Moetown relaxing in the jacuzzi after playing a game of after-dinner fetch. Oh what a life... Now Quincy on the other hand is my “princess.” While Moetown is playing fetch, Quincy is relaxing on the grass holding her frisbee. She loves to fold it in half like a taco. That’s it for today, hope I did good.